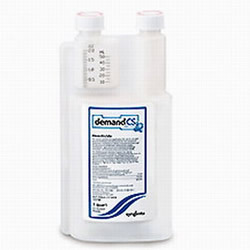 Demand CS is a microencapsulated water-based insecticide offering superior insect control with quick knockdown and long 3-4 month residual. A & E's Choice, great on Spiders, Crickets, and great for use in a maintenance pest control program. Can be used for Mosquito control in the summer, has no phototoxicity on many ornamentals and other plants. With Demand CS you are getting a very small amount of product to do a great job. Labeled for indoors, outdoors, and food handling establishments. Outdoors for perimeter applications and barrier treatments as well as applications to lawns, turf grass, and ornamentals. Indoors, Demand CS can be used for crack and crevice treatments. The 8oz bottle will yield from 18 to 36 gallons of finished product. You can save money by using these Generics, LambdaStar 9.7cs which is our choice for you, and Cyzmic cs both of which are Micro-encapsulated products.